We are all familiar with non-verbal communication – it is that aspect of our daily communication that requires no words, but rely on facial and body expressions, hands gestures, frequency of glances, pupil dilation, blink rate of the eyes, aspects such as pitch, volume, intonation and rhythm of the voice it also includes aspects such as the space and time around our bodies and environment. Non-verbal communication represents two-thirds of all our daily communications. All these indicators help us to code and decode messages from and to other people and as humans we are very good at it. We are constantly busy interpreting what other are saying to us non-verbally! Only a small percentage of the brain processes verbal communication. As infants, non-verbal communication is learned from social-emotional communication, making the face rather than words the major organ of communication. As children become verbal communicators, they begin to look at facial expressions, vocal tones, and other non-verbal elements more subconsciously. We are fluent in non-verbal communication long before we are fluent in words and sentences. 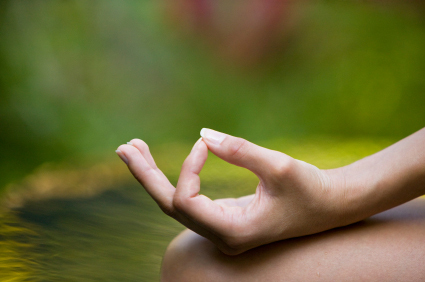 Mudras (the word means gestures) are the non-verbal communication aspect of yoga and Spirit. We employ our hands, face and even full body to activate certain energies on the subtle level of our existence and we communicate these energies to Spirit with the help of mudras. A mudra is a spiritual gesture and an energetic seal of authenticity employed in the art of communicating with Spirit. When we sit for example in Padmasana (lotus pose) we not only stimulate the process and flow of prana or energy in the body and on the subtle levels, but we are also indicating to Spirit our intention of sitting for meditation and thus inviting conducive energies to flow while we are in this state of meditation. In Tantra Yoga there are 108 mudras that we use to communicate to Spirit what we want to change, achieve or influence during such a performance. It is not the goal or scope of this article to give a description of all of them, but I would like to share a few general and powerful mudras with you and encourage you to please use these mudras when you feel the need for them. 1. Atmanjali Mudra (Gesture of Prayer) – The gesture is used for both greetings and farewells, but carries a deeper significance than a simple “hello” or “goodbye”. The joining together of the palms is said to provide connection between the right and left hemispheres of the brain and represents unification or “yoking”. This yoking is symbolic of the practitioner’s connection with the Divine in all things. Hence, performing Atmanjali mudra is an honouring of both the self and the other as the gesture acknowledges the divinity of both practitioner and recipient. On a spiritual level it communicates our devotion and readiness to give gratitude to the Divine for all our blessings. It also expresses our reverence to the Divine. 2. Abhaya Mudra (Gesture of Promising Protection) – Is a hand pose that is the gesture of reassurance and safety, which dispels fear and accords divine protection and bliss to the devotee. In Abhaya mudra, the right hand is held upright, and the palm is facing outwards. This is one of the earliest Mudra found depicted on a number of Hindu, Buddhist, and Jaina images. This mudra is usually used by a spiritually stronger person (like a deity, master or guru) to dispel fear in his/her disciples and to bring calmness into their hearts and situation. 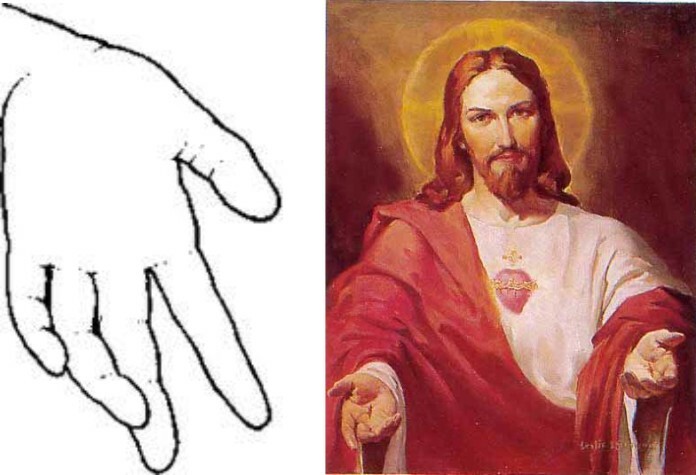 This is also a mudra that is depicted in Christian Iconography of Christ. We see Christ promising protection though this mudra to his flock. 3. Varada Mudra (Gesture of Granting Wishes or Mercy) – It indicates a gesture by the hand and symbolizes dispensing of wishes or mercy. 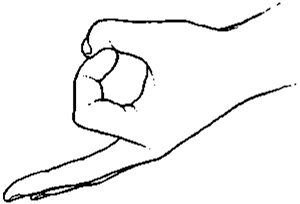 For Varada mudra, left hand is used. It is held out, with palm uppermost and the fingers pointing downwards. Again this mudra is mostly used by a spiritually advanced soul like a deity, master or guru, and is used to indicate that you need to practice the art of forgiveness in order to receive certain wishes or mercy. 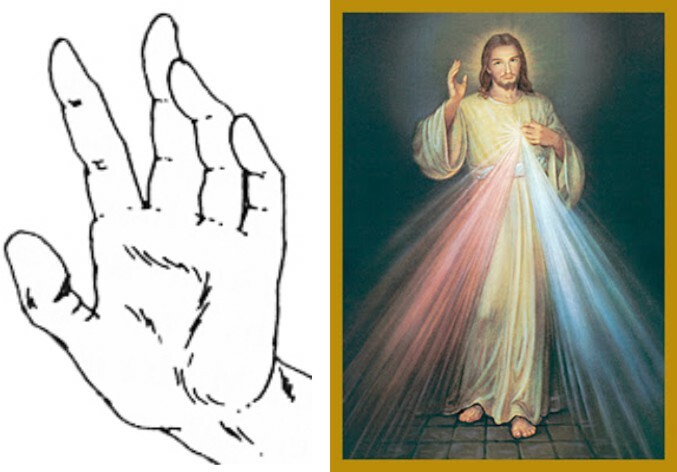 We see this mudra being used extensively in Christian depictions of the Christ when he shows his wounds in his hands to his disciples, which demonstrates the Great Act of Mercy the Christ performed on behalf of all his followers when he granted forgiveness to all by his sacrifice. 4. Dhyani Mudra (Gesture of Meditation and Contemplation) – This mudra forms into a sort of bowl in your lap and is commonly used in meditation. This is symbolic of emptying yourself to be filled with light. The gifts of light might come in many forms, like expansion of consciousness, greater insight or ease of mind. The point is to let whatever comes come, and trust that you are being cared for. The hands and fingers form the shape of a triangle, which is symbolic of the spiritual fire within all of us. When we assume this classical meditation mudra, we are indicating to Spirit that we are ready allow the Divine Force to act within me and for me. It is an indication that we surrender to Divine Will. 5. 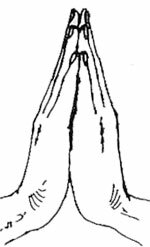 Jnana Mudra (Gesture of Knowledge) – In Jnana mudra the hands are placed on the knees in seated meditation with the palms facing up. 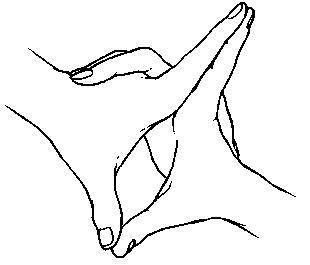 This mudra gives a feeling of spaciousness and has a subtle uplifting effect on the body and mind. In both Chin and Jnana mudra the connection made by the thumb and index figure is said to create a kind of circuit by connecting the terminus of certain nadi thus re-circulating the body’s vital energy. This mudra connects us on a subtle level to the vast body of spiritual knowledge in the Akasha (ether) and increases our spiritual wisdom. 6. 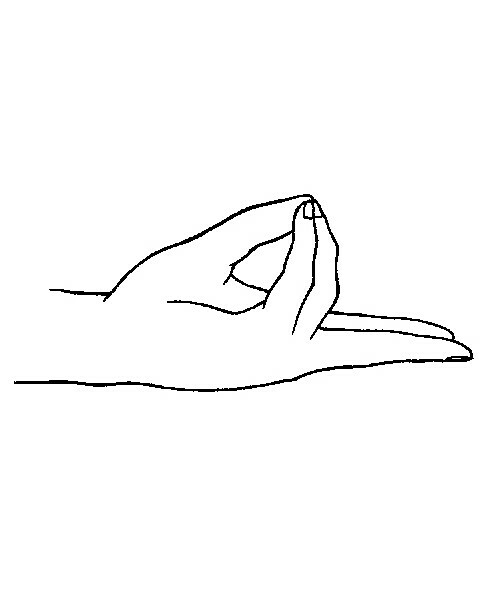 Chin Mudra (Gesture of Consciousness) – This mudra is used in either seated meditation or pranayama such as ujjayi. The hands rest on knees or thighs facing down. This Gesture has a grounding effect on the mind.The middle finger, ring, and little finger represent the three classic qualities of all of nature (the Three Gunas). The middle finger symbolizes sattva, (purity, wisdom and true understanding) the ring finger rajas, (action, passion and movement) and the little finger tamas, (inertia, lethargy and darkness). Classically the yogi is meant to transcend these states, progressing from darkness into light and from ignorance to wisdom. This mudra symbolizes the connected nature of human nature (prakriti) to that of Divine consciousness (perusha) and that we strive for greater connection with the Divine. 7. Yoni Mudra also Uttarabodhi Mudra (Gesture of the Highest Enlightenment) – Yoni is the origin of life. The yoni is also considered to be an abstract representation of Shakti and Devi, the creative force that moves through the entire universe. This mudra connects us with the Mother Principle in the Universe and as such serves to inspire us. It connects us with the Divine Mother and as such to the creative force in the Universe. Yoni is our muse or Divine Inspiration. 8. Pran Mudra (Gesture of Life Flowing) – In this Mudra the tips of the thumb,ring finger and the little finger are touched together while keeping the other two fingers straight. It awakens the dormant power of prana within us and as such provides us with energy when we need it most. 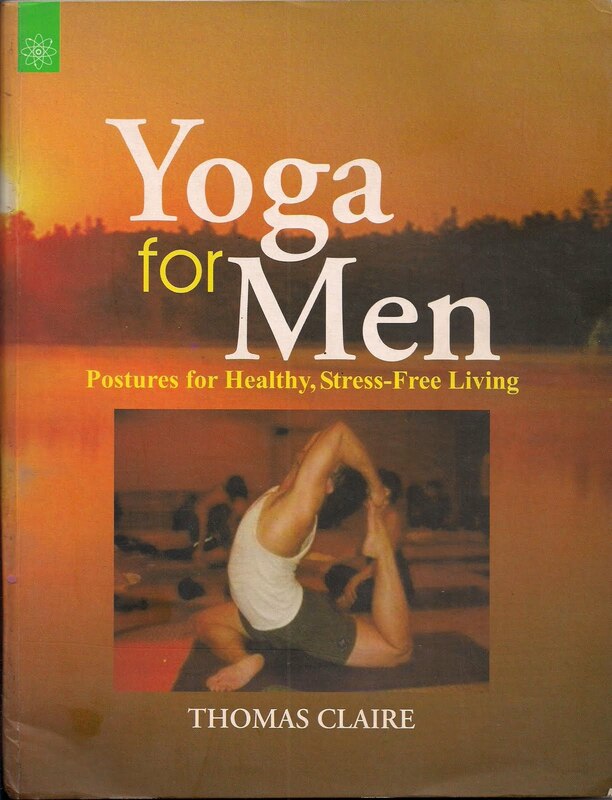 On a spiritual level it keeps us alert and helps us to maintain clarity during meditation. It anchors us in our meditation and as such strengthen our meditative resolve. Spirit provided us with powerful communication tools, of which mudras are extremely powerful, but also safe to use. I encourage you to explore the use of mudras in your life and use them on a regular basis, they have a profound influence on your spiritual awareness and evolution. This entry was posted in General Thoughts, Meditation, Yoga, Yoga Philosophy and tagged asana, Atmanjali Mudra, awareness, body, communication, Dhyani Mudra, Divine, emotions, gestures, hands, health, meditation, mind, mudras, non-verbal communication, philosophy, prakriti, soul, spiritual, spiritual path, tantra, Yoga, yogic, Yoni Mudra. I have always been fascinated by the markings in my palm and their changes and changes in my life. Am not sure how it is related, but since I have started meditation my life has changed a lot. My markings on the palm as you guessed have drastically changed. Do you think there are connections? These changes I have taken in a positive aspect thus enabling me to be close to my goal. Hi, Chirology or palm reading is of course a science just like the mudras on its own. The lines on your hands are dynamic and in constant flux depending on the change and transformation you allow in your life. The mudras connect to your subtle energy or prana and nadis and they communicate and affect our spiritual Self, whereas chirology relates more to the physical Self and what is happening there.